This WW2 Wings of Glory Starter Set is a complete game that includes everything you need to start playing the WW2 version of the system, but may be expanded with additional WW2 Airplane Packs and game sets to allow for larger battles with different airplanes. Wings of Glory is fast-playing and easy to learn. The Basic Rules give you a very simple starting point to start playing minutes after opening this box. After youâ€™re familiar with the Basic Rules, or if you are an experienced gamer, you may use the Standard or Advanced Rules, to make the game more challenging and realistic. 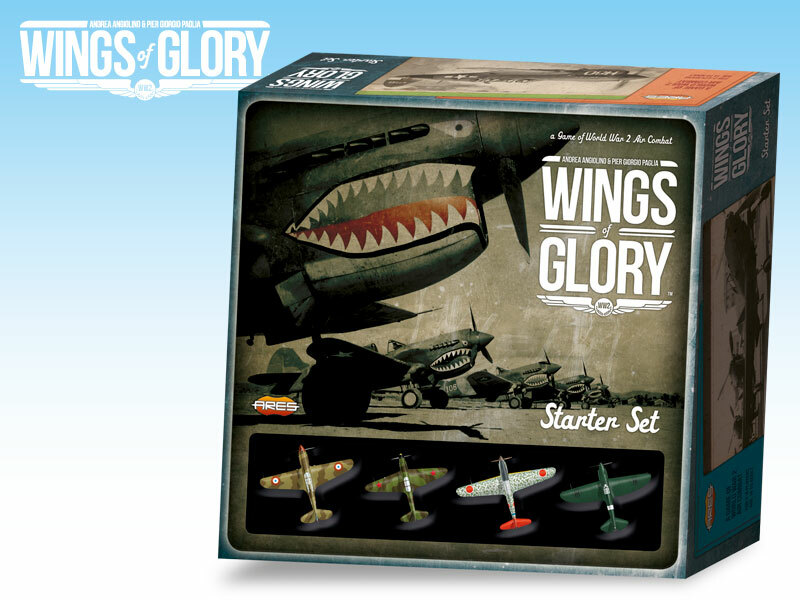 This Starter Set of Wings of Glory includes all you need to play in the WW2 period. Four different airplanes of different nationalities are included: a P-40 Warhawk, a Yakovlev Yak-1, a Kawasaky Ki-61 and a Reggiane Re.2001. In addition to these planes, you will find a rulebook including Basic, Standard, Advanced Rules; Optional Rules; Scenarios. Moreover, the Starter Set comes with a full assortment of counters, tokens, rulers, and airplane console boards, so that you can start playing out of the box in mere minutes! The Starter Set may then be expanded by purchasing Expansions, Accessories and Airplane Packs, but it's a complete table-top game in itself. You can add one or more Airplane Packs to the Starter Set to make the game more varied and play with more than 4 people. Be careful not to mix WW1 and WW2 airplanes however! They are not compatible with each other.